Mastercard is the second largest card scheme in the European Economic Area (EEA) in terms of consumer card issuing and value of transactions. Under the MasterCard scheme, banks offer card payments-related services under common card brands, Mastercard and Maestro. Mastercard acts as a platform through which issuing banks provide cardholders with payment cards, ensure the completion of the card payment transaction and transfer funds to the retailer's bank. When a consumer uses a debit or credit card in a shop or online, the bank of the retailer (the “acquiring bank”) pays a fee called an “interchange fee” to the cardholder's bank (the “issuing bank”). The acquiring bank passes this fee on to the retailer who includes it, like any other cost, in the final prices for all consumers, even those who do not use cards. Mastercard's rules obliged acquiring banks to apply the interchange fees of the country where the retailer was located. Prior to 9 December 2015, when the Interchange Fee Regulation introduced caps, interchange fees varied considerably from one country to another in the EEA. As a result, retailers in high-interchange fee countries could not benefit from lower interchange fees offered by an acquiring bank located in another Member State. In April 2013, the Commission opened a formal antitrust investigation against Mastercard to assess whether these rules on 'cross-border acquiring' were in breach of EU antitrust rules. In July 2015, the Commission issued a Statement of Objections. 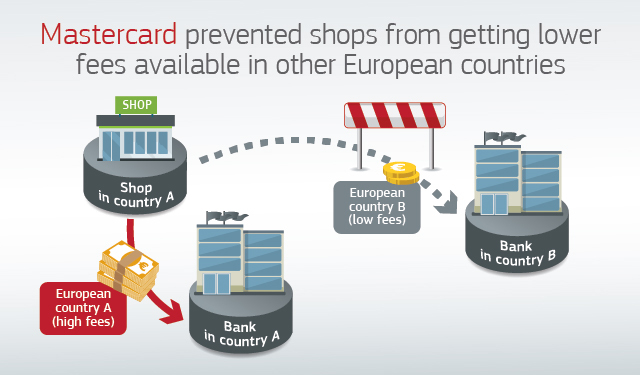 The Commission investigation found that because of Mastercard's cross-border acquiring rules retailers paid more in bank services to receive card payments than if they had been free to shop around for lower-priced services. This led to higher prices for retailers and consumers, to limited cross-border competition and to an artificial segmentation of the Single Market. On this basis, the Commission concluded that Mastercard's rules prevented retailers from benefitting from lower fees and restricted competition between banks cross border, in breach of EU antitrust rules. The infringement ended when Mastercard amended its rules in view of the entry into force of the Interchange Fee Regulation. The Commission granted Mastercard a 10% fine reduction in return for this cooperation.Further information on this type of cooperation can be found on the Commission's Competition website. The fine was set on the basis of the Commission's 2006 Guidelines on fines (see IP/06/857 release and MEMO/06/256). In setting the level of fines, the Commission took into account several factors, including the value of sales relating to the infringement, the gravity of the infringement and its duration, as well as the fact that Mastercard cooperated with the Commission during the investigation. The Commission concluded that Mastercard's rules until 9 December 2015 infringed Article 101 of the Treaty on the Functioning of the European Union (TFEU), which prohibits agreements between companies or decisions by an association of undertakings that prevent, restrict or distort competition within the EU's Single Market. More information on this investigation is available on the Commission's competition website in the public case register under the case number AT.40049. As of 9 December 2015, the Interchange Fee Regulation capped interchange fees in the European Economic Area (EEA) to a maximum of 0.2% of the transaction's value for debit cards and 0.3% of the transaction's value for credit cards. Before that, these fees varied considerably from one country to another in the EEA. Since the entry into force of the Regulation, retailers pay a reduced domestic or cross-border interchange fee, which brings retailers' costs down considerably. In the Statement of Objections addressed to Marstercard in 2015, the Commission also outlined its preliminary view that Mastercard'sinterchange fees applied to payments made in EEA with consumer debit and credit cards issued outside the EEA (“Inter-regional MIFs”) may breach EU antitrust rules. In December 2018, the Commission invited comments from interested parties on commitments offered separately by Visa and Mastercard to address the Commission's competition concerns relating to inter-regional interchange fees for card payment transactions. In December 2007, the Commission found that Mastercard's interchange fees on cross-border transactions in the EEA (e.g. when a Belgian citizen uses his card to pay in a shop in France) restrict competition between banks. In September 2014, the Commission's findings were confirmed by the Court of Justice. In 2009, to comply with the Commission's 2007 decision, Mastercard reduced the (intra-EEA) cross-border interchange fees applied by its member banks to maximum weighted averages of 0.2% for debit cards and 0.3% for credit cards. In December 2010and February 2014, the Commission also adopted decisions making legally binding commitments offered by Visa Europe (the former Visa scheme association of banks in Europe) to cap at the same levels (0.2% and 0.3%) the interchange fees for all intra-EEA debit and credit card transactions. The 2014 commitments also allowed acquirers to apply a reduced cross-border interchange fee (0.2% for debit and 0.3% for credit) for cross-border clients. In April 2015, the EU's Council of Ministers and the European Parliament adopted the Interchange Fee Regulation, which from 9 December 2015 capped interchange fees for cards issued and used in Europe (maximum of 0.2% for debit cards and 0.3% for credit cards). The Interchange Fee Regulation established a level playing field for the card payments in the intra-EEA transactions market as a whole. However, the caps of the Interchange Fee Regulation do not apply to inter-regionaltransactions (i.e. those involving cards issued outside the EEA), as the Regulation does not apply to cards issued outside the EEA.